With a separate and extensive gluten free menu, including starters through to desserts, there are plenty of choices at The Bank on Collins. A breakfast menu, and set breakfast menu is served, and gluten free options are marked. There's even a dedicated gluten free fryer, so please mention your dietary requirements to staff when ordering. Food is 100% local - local produce, local meat and only the finest ingredients. Housed within a prominent and stylish heritage listed building, formerly the Bank of Australasia, this immaculately renovated restaurant has modern amenities and a corporate upmarket feel with affordable prices. The ground level lobby and mezzanine area create a versatile floor plan that accommodates any style of event, catering for close to 700 people across both levels. The venue is fully licensed. 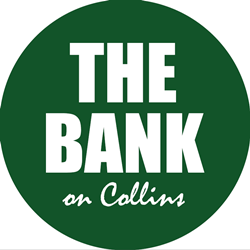 Treasury on Collins serviced apartments are located directly above.